Santa Maria Surfing Beach Village is a complex built to meet the needs of the most demanding guest, with installations that offer all kind of modern conforts. 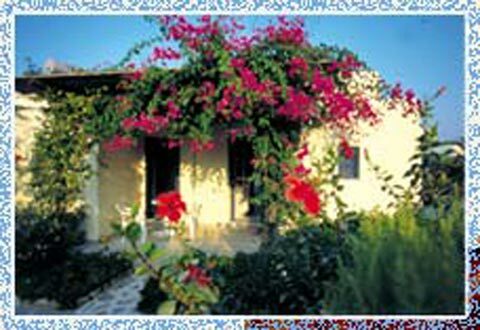 It is situated on the beach and it is built in the traditional Cycladic style, surrounded by trees and flowerbeds. Surfing Beach Village desposes 48 furnished bungalows with veranda in the garden, air-condition, T.V. set, refrigerator, bathroom and direct dial phone. Our reception department (08.00-02.00) offers exchange, car and bike rental, post service, sailing tours, horse riding, mountain bike riding. There is also breakfast service as well as a specially disigned area for breakfast. In addition there is also a variety of other services such as restaurant, tavern and bar on the beach, 24-hour bus service, mini-market, surfing and diving club, tennis-court, swimming-pool with bar, children�s playground, etc. Those of you who wish to spend your holidays away from the crowds of the peak tourist season, take advantage of our special offers during the low and middle seasons.